German Chamomile essential oil affects one’s mood and it can result in inner peace and solitude. It may be diluted and massaged on the forehead, nape, and back. While risks in using German Chamomile is yet to be established, it is best to avoid it if you have history of allergic reactions to Chamomile or any other herb belonging to the Ragweed family. German Chamomile essential oil creates an enticing scent when combined with Clary Sage, Bergamot, Lavender, Geranium, Jasmine, Grapefruit, Rose, Tea Tree, Lemon, Ylang-Ylang, and Lime. 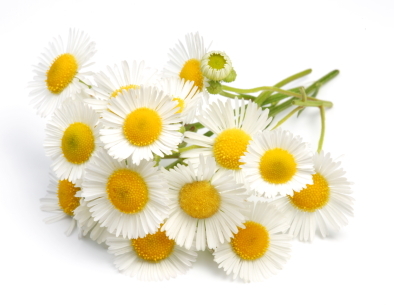 German Chamomile is great in keeping the skin moisturized. For a handy hydrating mist, combine 2 drops each of German Chamomile and lavender oils, drop of rose otto oil and 4 ounces of distilled water and put in an atomizer or spray bottle. Bring and spray as needed when you are running, playing sports outdoors or sunbathing. To keep hair’s natural moisture and prevent drying, mix together 2 drops of German Chamomile, rosemary, lavender, and 4 tbsps of sweet almond oil. Massage into scalp and hair at least once a week and occasionally leave it on overnight. To improve skin tone and remove blemishes, add a few drops to your regular facial toner and use cotton balls in applying to face. To relieve severe pain like migraine, use cool water to moisten a face towel and drop some German Chamomile essential oil on it. Lie down, close your eyes, and place the damp towel on your forehead. Relax. Better yet, have some sleep. For stiff neck, muscle cramps, or arthritis, mix 2 drops German Chamomile, 2 drops Rosemary, and 2 tbsps sweet almond oil and massage on painful areas. Get Your German Chamomile Essential Oil Now! True blue German Chamomile oil. A few drops will be enough for stirring into a full-sized jar of face cream, a cup's worth of your favorite carrier oils or a bottle of body lotion. The intense blue color will turn your face cream a pale cornflower blue once thoroughly mixed in but won't stain your clothes or skin if kept at the right ratio to oil/cream.